Around Manaslu Trek or Manaslu larke pass trekking tour lies in 100 Km northwest from Kathmandu in the lap of Manaslu Himal. Mount manaslu is the eighth highest mountain in the world. Hike to Manaslu is very popular the last couple of years especially after the Earthquake disaster n 2015. The Manaslu Base camp with larke pass trek became very famous after the trail opened for foreign nationals in 1991 AD. Majestic and mystical adventure Manaslu trek offers an opportunity to explore the beautiful mountains such as Himal Chuli (7,893m), Annapurna range, Shringi (7,187m) Ngadi Chuli (7,871m) and Ganesh Himal. And those Manaslu Himalayan ranges are a source of the Budi Gandaki River. Further more, along with the journey Lho, Sama Gaun and Samdo village are the most culturally famous to make short side trips and in the meantime, you will have incredible views of mount Manaslu range. Moreover, you can hike to Manaslu base camp via Pungyen Monastery where you can see an impressive view of Mt. Manaslu glacier and Himalchuli with Birendra Lake. Besides that, there are some pristine lakes (Dud Kunda Lake) along the Larke la pass. According to gokyo treks agency travel expert, manaslu trek cost is totally depending upon the months that you visit. Visit Manaslu in March/April/May will have the cheaper tour cost because of Manaslu trek permits. Additionally, if you make a plan to manaslu circuit visit in September/October/December, then manaslu royalty is a little bit more expensive but the weather stays perfect with blue sky and sun shining. Larke pass Manaslu trek difficulty stays with soft to moderate adventure grades. Trekking in manaslu circuit is also best for beginners because of smooth ascending. Book an experienced mount manaslu trek guide to make your trip safeer and unforgetable. Nepal manaslu trek without guide is not possible because nubry valley section is totally protected area under the Government of Nepal. Samagaon is an interesting place for manaslu base camp day trip. It takes about 4 hours roughly to ascend to reach at basecamp and 3 hours descend to the lodge. Manage your little time to prepare your manalsu holiday reading manaslu trek blog as describe. Watching these Himalayan ranges and descend to the Beautiful village of Bhimthang and Dharapani where you met the main Annapurna trekking trail. Manaslu round trek or Manaslu circuit trekking can be done any time (except winter) throughout the year. Our trek around Manaslu is a classical trek with 15 days itinerary compared to most walks in this region. 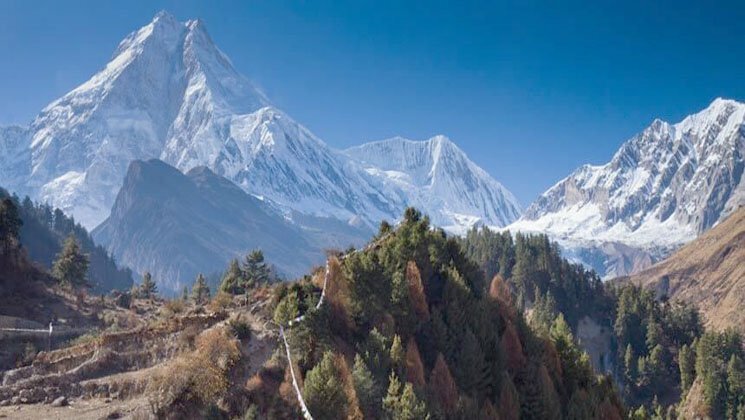 The particular route is designed for World travelers who wish explore Manaslu within relax manner itinerary however if you are planning with limited time wise than take a look this special itinerary on Around Manaslu short trek – 13 Days which would be a more appropriate choice. Upon arrival in Kathmandu, Tribhuwan International Airport, we will receive you with private vehicle and transfer to hotel in Kathmandu within B/B plan. Our representative will give you information around Manaslu trek programs. Day 2 Kathmandu World heritage sites tour, 6 hours !. All aspects of gear and conditions are discussed to make sure you’re fully prepared for the trip. After lunch, we explore this medieval city includes Boudhanath stupa (known as the tallest stupa of Nepal), Pashupatinath Temple (recognized as a holy temple of Hindu) where cremation takes place by the holy river Bagmati. Later we visit Kathmandu Durbar Square than walk to the hotel through the oldest markets. Your trekking staff will come to your Hotel early in the morning at 7.00 am to pick you up; from there we have an 8 hour driving journey to Arughat. From Kathmandu to Dhading Bensi for 3.30 hours is a comfortable drive but from there to Arugat for another 4 hours, we will be driving on a dirty road. Day 4 Trek to Soti Khola (775m/2,534 ft), 6 hours. Day 5Trek to Machha Khola (900m/2,943 ft), 5.30 hours. The trail descends slowly until you climb again to mountain ridge to Almara. Pass the forest trail to arrive at Riden Gaon. The valley here cuts into another side of the river to enter Budhi Gandaki. At Labubesi, the trail follows down to the sandy river bed of Budhi Gandaki. Day 6Trek to Jagat village (1340m/4,382 ft), 6 hours. Day 7Trek to Ngyak phedi (2,310m/7,554 ft), 6 hours. After ascending to a terraced hill of Saguleri and view of Sringi Himal (7177 m). we continue towards Sirish Gaon, Gandaki valley narrows from herewith soaring precipitous walls. Day 8 Trek to Ghap village (2,100m/6,867 ft), 7 hours. Day 9Trek to Lho village (3,200m/10,464 ft), 7 hours. After crossing the wooden bridge over Budhi Gandaki we follow the path lined with houses that are interspersed with cultivated fields. At Namru, there is a police check post again. After Namru, across the Hinan river originating from Linda Glacier and continue on to Sho. Naike peak, Manaslu north (7,774 m) and Manaslu (8,150 m) are visible from here. Tonight we fix the camp near a spring at Lho gaon – a small village. Day 10Trek to Sama gompa (3,500m/11,445 ft), 6 hours. We will spend a day here in order to acclimatize and adjust to the thinning of the air and also for light hiking to visit Birendra lake – glacial lake. You can also hike to visit Phungen Gomba to visit one of the oldest gompas of Manaslu area. Day 12Trek to Samdo village (4,500m/14,715 ft), 5 hours. Today, we climb a terraced hill on the opposite bank of Budhi Gandaki River from here toward a most remote permanent settlement to Samdo. Here amid the most sever conditions of nature live some 200 in forty houses check-by-jowl. Day 13Cross Larkya La (5,215m / 17,053 ft) and trek Bhimthang (3,590 m), 8 hours. We first climb towards Cho Chanda and then slowly head steeply uphill towards the snowed-up pass. From the top the panorama is magnificent: Himlung Himal (7,126 m), Cheo Himal (6,820 m), Gyagi Kung, Kang Kuru (6981 m) and the Annapurna II (7937 m). The descent is steep, through moraines, towards Bhimphedi. Day 14Trek to Tilje village (3,900m/12,753 ft), 5 hours. The route gets easier. We start with a gentle climb through paddy fields towards the small Karcha La pass and descend through big tree and rhododendron forests to Gurung Tilje village. Day 15Trek to Tal (1,725m/5,640 ft), 4 hours. Drive out to Besisahar, 6 hours. Follow the trail downstream of Marshyangdi River, passing through the scattered villages to reach Tal village where we can have a lunch. After delicious Lunch, taking a local jeep (passenger collection basis) drive downhill to Besisahar. After breakfast, At morning time, we drive back through the scenic countryside and during the route will stop for lunch in Malekhu highway than we drive another 4 hours to reach to Kathmandu city. On arrival at Kathmandu, guide will transfer to the hotel and rest. Trip Finish. How much does the around manaslu trek cost? Hike to Manaslu circuit trek trip is available on USD 1,050 per person. In this price, we offer you Tourist Standard accommodation in Thamel, Kathmandu and of course the trip price will vary according to group size. For the deluxe and luxury Tent style trekking tour plan, 3-star category hotel deluxe air-conditioned room in Kathmandu (BB PLAN) with attached bathroom while on trekking on possible places, so let us know the new quote. AND WE ARE OPEN TO CUSTOMIZE YOUR TOUR AND PACKAGES PRICE AS PER YOUR REQUIREMENTS. International tour leaders are highly encouraged to get discount and attractive complimentary. Local Bus transfer from Jagat to Besisahar and to Kathmandu. We can organize private trip about Manaslu circuit trek starting at any date that works for you. Please contact us for more information. Answer: All the guest houses/lodges in Manaslu circuit trekking, they have attached restaurant and they cook a delicious range of mostly vegetarian such as Pasta, tuna bakes, noodles, potatoes, eggs, dhal bhat, bread, soups, fresh vegetables (variety depends on the season). Answer: All the lodges they have a shower which you can get it somewhere paying and somewhere without paying however if you are in camping trekking – we provide you hot water bucket then you will take a bucket shower. Answer: On lodge trek, there will be more chances to charge the battery. We recommend you bring an extra pair for in case. Remember to bring your adapters! Answer: Sometimes, you can get telephone services. we recommend you to buy a local NTC sim card. Answer: No! So, far for the trek, you need to have cash Nepali rupees because credit cards work only in the bigger city areas. Question: Is it possible to hire a local guide for Manaslu? how to hire a manaslu trek guide? Manaslu 8163m trek offers picturesque villages, turbulent river gorges with nice waterfalls. Fantastic views of Mt. Manaslu, Mt. Himchuli, Mt. Ganesh and others, Larkya La pass (5,153m). We (a group of 3) recently completed a two week Manaslu circuit trek with Gokyo Treks and Expeditions. Our trek was absolutely wonderful! Ammar helped us to plan the trip and was informative and easy to communicate with both in the lead-up and once we had arrived in Nepal. Everything was taken care of which meant we could really enjoy the journey rather than spending time on logistics. There was also flexibility in our itinerary which we really appreciated. Our guide Bhupal was excellent as was our kind and helpful porter Bikash. We never felt rushed and learned a lot about the country, environment, and culture from both our guide and porter. Bhupal was knowledgeable about the area, professional, reassuring and had a good sense of humor! He always had useful tips and advice and it was clear that he had our best interests in mind. Bhupal was a great company from start to finish- we were sad to say goodbye at the end of the trek! The Manaslu circuit itself is beautiful with a diverse range of scenery. We’d highly recommend this company if you’re considering trekking in Nepal! !!! – Anna Rathe, New Zealand.